Bryant, Adam. (2011). Corner Office. New York: Time Books. Serendipity and Synchronicity. While sitting in the airport one early morning I picked up the business section of the Austin Statesman. 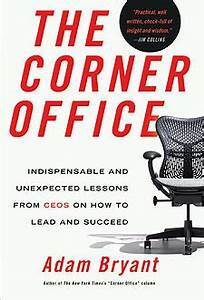 Always interested in leadership, I found an article written by Adam Bryant about his book, Corner Office. I didn’t know the author, but it was summarizing interviews with seventy CEOs. Adam wanted to get the best suggestions about leadership from multiple sources. I was so intrigued by the article, I bought the book. I recommend it highly. I was thoroughly impressed. Here some of the highlights. “What lessons have you learned that you can share with others? How would you answer those questions from Adam? The culture in business, government, and education start at the top of the org chart. People may not hear what you say or read what you write, but they will always believe what you do. I found this quote to be applicable to education, “Most businesses fail because they want the right things but measure the wrong things, and they get the wrong results” This is indicative of the problems of attribution error and confirmation bias. Employees collude by giving answers that the leader wants to hear rather than the honesty of the real life. Building teams and getting good ideas are organizational goals, not the smartest book knowledge. I like to have the knowledge, it is important, AND it is insufficient. I think you have to be able to do (practitioner) as well to know (theory). “I like building teams with people who come from very different backgrounds and have very different experiences,” said Susan Docherty, a vice president of General Motors. I can learn twice as much, twice as quickly, if I’ve got people who think differently than I do around the table. There are no silver bullets. Quit looking for them. Try ideas, see if they work. If they do, keep doing it. If they don’t, get feedback, change it, and move on. Bill’s Note: The following are direct quotes from the book. I encourage leaders to buy the book and use the recommendations from these leaders. I use [ ] to note inserts by me. What does it take to lead an organization? What are the keys, the x-factors, to achieving the highest levels of success? The good news: these keys to success are not genetic. It’s not as if you have to be tall or left-handed. These qualities are developed through attitude, habit, and discipline—factors that are within everyone’s control. These aren’t theories. They come from decades of collective experience of top executives. CEOs are not necessarily the smartest people in the room, but they are the best students—the letters, CEO, could just as easily stand for Chief Education Officer. They learn, they teach, and they understand people and the business world, and then bring all that knowledge together to drive their organizations forward. “You learn from everybody,” said Alan R. Mulally, the CEO of the Ford Motor Company. I say only one thing, ‘Tell me what you’re passionate about.’ That’s it. Robert Iger, the CEO of Disney, said curiosity was a key quality he looked for in job candidates. Passion. Curiosity. Both are important. There are plenty of people who are passionate, but many of their passions are focused on just one area. There are a lot of curious people in the world, but they can also be wallflowers. David Novak of Yum Brands. How come it’s done this way? Tim Brown, the CEO, lDEO. “It’s not possible for the CEO to know everything, but it is possible for us to add value to literally everything,” Jen-Hsun Huang. They show interest and enthusiasm, and they ask questions. They focus on being interested rather than trying to be interesting. Other qualities are tougher to discern, especially the ability to handle adversity. [If] they have a track record of overcoming adversity, of failing and getting up off the mat to get the job done, no matter what. They have battle-hardened confidence. [What do they do] when they are faced with potential or real failure and the status quo is not an option. The best predictor of behavior is past performance, and that’s why so many CEOs interview job candidates about how they dealt with failure in the past. “I think hiring great people remains extremely, extremely hard,” said Jen-Hsun Huang of Nvidia. “The reason for that is this: It all comes down to how somebody deals with adversity. You can never really tell how somebody deals with adversity, whether it’s adversity that’s created by the environment or adversity that you’re creating for them. Do they make the most of whatever hand they are dealt? The most predictive trait is still demonstrated achievement. But then there are a set of personal characteristics, and the number one most predictive trait is perseverance, or what we would call internal locus of control. The best hitters in Major League Baseball, world-class, they can strike out six times out of ten and still be the greatest hitters of all time.’ That’s my philosophy—the key is to get up in that batter’s box and take a swing. If candidates can explain what they’ve learned from those experiences, and how they dealt with them, they may find their résumé goes to the top of the pile. A dream employee will eagerly accept a challenge and say those words that are music to a manager’s ears: “Got it. I’m on it. In a world in which work is increasingly done through collaboration, team smarts is an essential skill. It starts with an understanding that teamwork is built on a foundation of one-to-one interactions between people, an unwritten contract that has nothing to do with business cards, organization charts, or titles. What 1 realized was that if you give people really big jobs to the point that they’re scared, they have way more fun and they improve their game much faster. We have a bench, and everybody has to be strong. One of the simplest ways to think about teamwork is to forget organizational charts and titles. Companies increasingly operate through ad hoc teams, formed and disbanded to accomplish various tasks. Team smarts refer to this ability to recognize the type of players the team needs, and how to bring them together around a common goal. Next time you’re in a meeting, ask somebody to give you the ten-word summary. Mark Twain: “I didn’t have time to write a short letter, so I wrote a long one instead.” The shorter your business plan is, the more succinct and to the point it is, the better. “Schools could do a better job teaching the value of brevity, said Guy Kawasaki, the co-founder of Alltop. William Green of Accenture offers a telling example of the art of simplification. He said he counted sixty-eight things that the managers were told they needed to do to be successful—“everything from how you coach and mentor to your annual reviews, filling out these forms, all this stuff.” There are three things that matter. Competence—just being good at what you do, whatever it is, and focusing on the job you have, not on the job you think you want to have. People want to know what you think. So you have to have enough desirable self-confidence to articulate a point of view. Nothing today is about one individual. This is all about the team, and in the end, this is about giving a damn about your customers, your company, the people around you, and recognizing that the people around you are the ones who make you look good. “Learning how to delegate, learning how to let go and still make sure that everything happened, was a very important lesson in my first role in management. Is discomfort your comfort zone? Risk-taking doesn’t quite capture the quality that many CEOs embody and look for and encourage in others. Even when things appear to be working well—is only going to put you behind the competition. If you’re fearless, you can take on a bit of a risk to change things for the better. The biggest problems I see in a group of people who don’t embrace change is that they will always fight anything new, any new idea, any new concept, any outside point of view. I have to have people who not only can manage change but have an appetite for it. I love asking people how they made their career decisions, why they made those decisions? What I find is that a lot of people I relate to or even work with have taken segues like that. They tend to be more intellectually curious, so they don’t just have vertical climbs. I ask for those stories. I love hearing them and it gives me a real sense of the person. The qualities [this CEO] wanted to see were adaptability and flexibility. Fearlessness is an attitude, and because attitude is one of the few things over which everyone has complete control, it is a character trait that can be developed. “I try to get out of my comfort zone every day,” said Steve Hannah, CEO of The Onion. Management jobs are a very public form of on-the-job training—people have to learn how to handle the work under the bright lights of center stage as employees scrutinize every move. The warm, fuzzy stuff is hard. The quantitative stuff is easy—you either don’t do much of this as a manager or you have people working for you to do it. Maybe, it was just my education, but much of education is backward. You study all the hard stuff, and then you find out in the real world that you don’t use it. Cristobal Conde of SunGard said he builds thinking time into his daily schedule. One way to get away from all the gadgets is to go to a place where they not only don’t work, but they’re also banned: at 35,000 feet or so on a plane. CEOs can be grueling, flying time is, they admit, a useful opportunity to think in peace and quiet. It’s time to be reflective. It’s time to catch up. It’s time to really be thoughtful and communicate. “We have a little joke where I’ll tell people, a light bulb or a gun. A light bulb means this is just an idea I had, so think about it, see if you think it’s a good one. Either follow up or don’t, but it’s just an idea. A gun is, I want you to do this. People don’t always know if you mean something as just as an idea, or you want them to go do it. Type 1: Decisions are the decision-makers sole decision—dictatorial. Type 2: People can provide input, and then the person can still make the decision. Just tell me about your life. Start wherever you want to, from the beginning or the end, but talk to me about you, what you’ve done, and then walk me through what you’ve done with your career. Curiosity. If you don’t read a lot, then you’re not a very curious person. “Who are the best people you recruited and developed and where are they today?” Today, you are their boss. Which one will you hire and why?’ That’s a question that has gotten me the right person all the time because I know the three or four people you’ve interviewed with, and it gives me an idea how quickly you can find out their strengths and weaknesses. Do you know what you re good at, and what you need to work on to get better? I always ask people, ‘If you could be in my shoes today, what would be the top three things you’d do?’ I think that you really do get some very candid, on-the-spot thinking when you ask them what they would do if they had my job. “What is it that appeals to them about the job they’re interviewing for?” That’s always quite an interesting opening question. A Writing Sample – demand to see a piece of writing. ‘Do they have a sense of curiosity about the world? Are they just repeating things they’ve read, is there some sense of engagement with it? And their ability to express themselves, I think, is tremendously important. I tell them to give me what they think is the best example of their ability to communicate. An absolute must of the hiring process is to share a meal with someone because it’s a good way—outside the controlled environment of an office—to find out what somebody really likes. People report to managers, but they follow leaders. There is no formula for creating a sense of mission; though certainly, one necessary ingredient is a conviction, since nobody will follow a leader who doesn’t believe wholeheartedly in what he or she is saying. “I think the most important thing is coming to a shared view about what we’re trying to accomplish—whether you’re a nonprofit or a for-profit organization,” Mulally said. “What are we? What is our real purpose? And then, how do you include everybody so you know where you are on that plan, so you can work on areas that need special attention. And then everybody gets a chance to participate and feel the accomplishment of participating and contributing. “It’s fundamental communications, in terms of your ability to get out there and be with your people, tell a story,” “People really have to begin to believe in a story to get passionate about the direction the company is going in, which hopefully you’ve been able to do through the way you articulate it. Simplifying the complex so that people can get their arms around it and see how they can make a difference. “I think there are two things that are very important about recognition,” he said. “One, it needs to be deserved. And two, it needs to come from the heart. Creating an effective culture is an art, and in the bottom line, results-driven world of business, culture can be relegated to the backseat, an afterthought filed under nice-but-not-necessary. Recognize that culture is the engine that drives results and that by creating the kind of culture where people want to come to work—and where they don’t check a good portion of themselves at the door—the company can generate exceptional results and outperform competitors. People typically leave their companies for one of two reasons. One is that they don’t get along with the boss. The second is that they don’t feel their efforts are appreciated. Be passionate about what you do and be interested in making the people around you better. These people show humility. They’re selfless. They will work for other people’s success. Learning to lead requires making sense of a unique mix of a particular leader’s prefacing at any given moment and the personalities of the people she manages. People learn to lead through experience; there really are no shortcuts. Effective managers, like good coaches, can make people better at their jobs. But leaders also have a feeling, an instinct, for what people are capable of becoming, even if they can’t see it themselves. Leaders who are committed to helping the people who work for them will have committed followers. “The best leaders I’ve known really take an active interest in a person. The ability to bring a team together to achieve a goal is a rare skill, and CEOs are often rewarded handsomely for it. A second point is that all organizations are significantly diverse today; don’t have as many command-and-control [organizations] anymore. “I think a leader has to be comfortable with having the weight on his shoulders,” “Do you really want the job?” “On the outside, it looks very shiny,” he said. “But there’s a lot of hard work, and you get paid to do all the uncomfortable things. There’s never an end point, and it can take years of trial and error before people feel comfortable in the role, striking the right balance of being friendly, though not friends, with the people they manage, and learning how to be a boss without being bossy. Effective leaders must care about people enough to get the best work out of them, yet they must keep a distance so that any difficult conversations are about performance. Sometimes leadership is about having the right answer; other times it’s about having the right question. If the question is, can leadership be taught by one person to another, or to a group, the answer is no. There are just too many variables. The onus is really on the student, the person who is learning to lead. They can learn from their experiences, from good bosses and bad bosses, from colleagues and peers, and from the stories told by other executives. Leaders who have solved the puzzle in their own way—at least to a point, since it is never quite finished—will convey authenticity. And it is authenticity that will be most effective in marshaling teams to work together to achieve a shared goal.